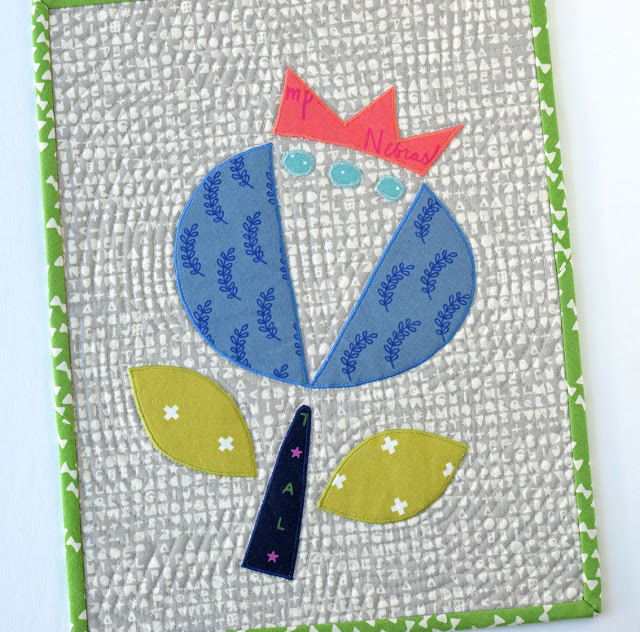 My Quilt Infatuation: Happy Needle and Thread Thursday! Hey there, y'all! The tradeoff for going back to school at the beginning of August is that we are out for summer before Memorial Day, which means it's officially the final week of the school year for us, and my heart is so happy! In case you missed my post yesterday, I finished up my Pop Star quilt, complete with some pretty intense free motion quilting (for me, anyway). Today, I've been playing with these gorgeous fabrics. 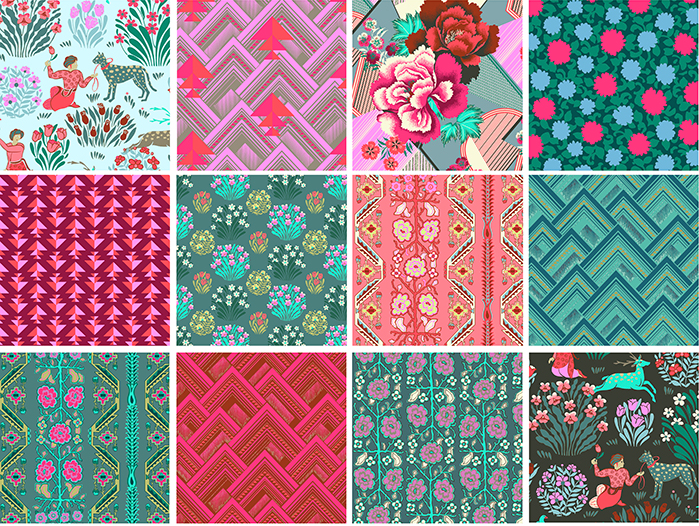 This is the Splendor collection by Amy Butler, and the colors are so luscious. For full disclosure, these are the stock photos from Amy Butler's website, because I just couldn't get photos that did proper justice to the colors. Ordinarily, I design a pattern first, and then pull fabrics with the specific design in mind. My local shop stocked layer cakes of this collection and I certainly wasn't going to miss out, so this time my process is a little backward. I don't usually work with precuts, nor do I usually design patterns for precuts, so it has taken me much longer to decide how to use them than usual. Never fear though, I have done some sketching and settled on a design that I love, that will really show off these colors and prints. Before we get to the highlights from last week's party, I owe you five giveaway winners! Just an FYI, the first winner is from the Sliding Geese Mini post, which was part of the Benartex Summer Mini blog hop, which was separate from my My Sponsor News post. Since there are so many winners, I'm going to list them out for you to make it easier to follow! BIG congrats to all of the winners, and a HUGE thank you to all of my fantastic sponsors for providing such amazing prizes. I'll be contacting each of you via email shortly! Okay then, let's check out some of the projects from last week's party that really caught my eye. Gasp! This Courthouse Steps stunner is by Maryse Makes Things, and oh my goodness. Just look at that quilting! This fun quilt is called Party Pop, by Slice of Pi Quilts. and this Pretty Posy Mini by Paige at Quilted Blooms is so sweet! Okay friends! Time to get our party on! The Splendor collection fabrics are gorgeous. I am sure you will make a beautiful quilt with them. Congrats to the fabric winners. The colors and designs in Splendor are beautiful! Kelly, THANK YOU! Thank you for featuring my little mini and how awesome that I won the FQ bundle! Woohoo! Oh wow! It's me! Thanks Kellie, my first ever fabric win!!!! Those are gorgeous fabrics. Looking forward to seeing them shown off to great advantage in your next quilt. Looking forward to your layer cake creation - I love precuts, especially layer cakes! I love that courthouse step pattern and the way it was quilted suits it just right. I love the look of the straight or slightly curvy line quilting. Kelly! Thank you for featuring my Party Pop quilt! Your FMQ on the Pop Star quilt came out beautifully, Kelly - I especially love the organic crosshatching in the centers. I'll have to try that one some time because crosshatches are my favorite "solid" blenders in my stash and the motif looks delightful as quilting! I just looked at your quilting. You should never offer any apologies for anything you quilt because it is an art. Plus, your quilting is gorgeous!! It looks as though it was done by someone who had been using a long arm for many years. If I could quilt that well, I hope I could just accept the praise with a simple thank you. 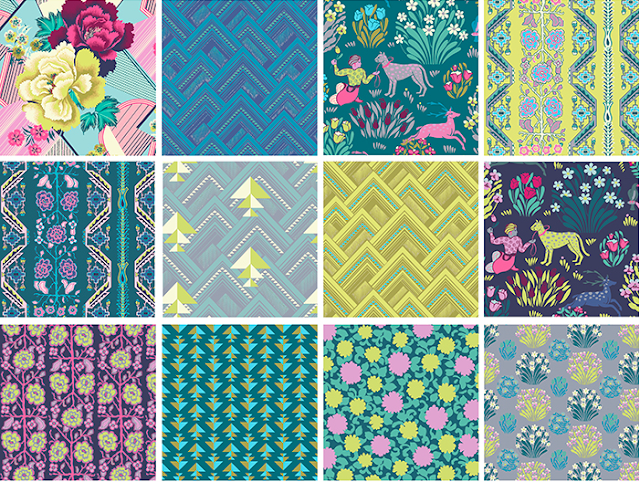 All your quilt designs are stunning! How you teach and quilt at the same time astound me. Awww thanks Kelly for featuring my quilt this week! !